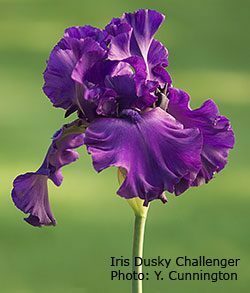 Bearded iris care is a bit more involved than it is for many perennials. Mostly that’s because they need to be divided every three to four years for best growth and flowering. But this shouldn’t put you off from growing these beautiful perennial flowers. For success with these perennials, follow the bearded iris care tips outlined below. Water: Bearded irises have excellent drought tolerance, but need regular watering after planting and throughout their first growing season; after that, normal rainfall should provide adequate moisture. Like all plants, they will respond to extra watering in periods of serious drought. Fertilizer: Fertilize in spring when growth starts and after flowering, using 5-10-10 or 10-20-20, not high nitrogen. Alfalfa pellets are a good organic fertilizer choice; sprinkle a handful per plant and water in to help pellets break down. Grooming: After flowering, cut or snap flower stalk off at the base; remove any leaves that wither or brown (new leaves will replace them). In fall, remove all dead leaves to avoid over wintering insects, such as iris borer, and diseases that can cause rot. Mulch: If you don’t get reliable snow cover, evergreen boughs make effective and airy mulch; apply after freeze-up. Do not mulch bearded iris with wood chips or other organic mulches, as this can promote rot. Remove evergreen boughs promptly early in spring. For best growth, divide and replant bearded irises every three to four years, or you will get fewer flowers as the clumps get crowded. This is also the quickest and easiest way to propagate new plants. Dig around clump with a garden fork about 6 inches (15 cm) from rhizomes and ease plant out of ground. Work on one clump at a time to avoid getting colors mixed up. Wash off soil; with sharp knife, divide rhizomes into single plants with one leaf fan. Discard old, soft or diseased rhizomes. Cut leaves to 6 inches (15 cm) in height. Dry for a day to allow cuts to dry and seal; if replanting in same spot, amend soil with compost or well-rotted manure and add couple of handfuls of alfalfa pellets. Water well after planting, and continue to water a couple of times a week as the plants get re-established.